On Wednesday, the price of the currency pair EUR/USD has grown considerably. The Unified European currency was supported by positive inflation data in Eurozone. In April this index rose to the level of 0.7% versus 0.5% in March. Although the target level of 2% is still far away, investors hope that deflation is no longer a threat for Eurozone. Additional pressure on the American currency was caused by preliminary data on the US GDP. In Q1 this index rose only by 0.1% against expected 1.2%. 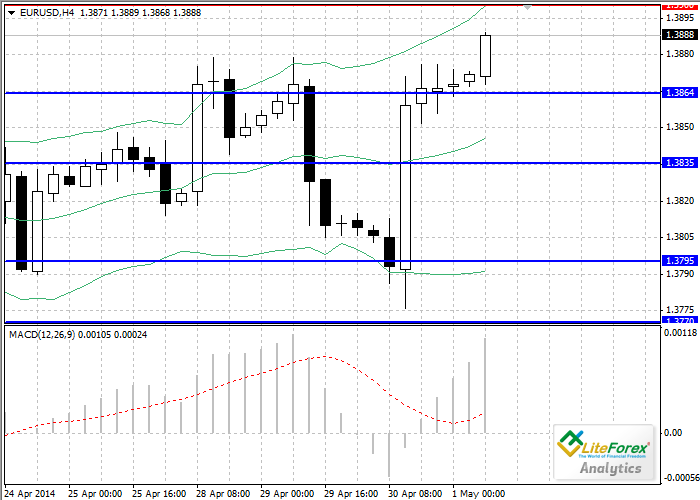 Amid this news EUR/USD managed to soar up to the highs of April at the level of 1.3886. Market participants will wait for the data on business activity index in the US manufacturing sector today. Experts expect that the index will go up to the level of 54.3 points. Support levels: 1.3864, 1.3835, 1.3795 and 1.3770. Resistance levels: 1.3900, 1.3945 and 1.4000. On the four-hour chart technical indicators show continuation of the upward movement. Bollinger bands are directed upwards. MACD histogram is above the zero line and its volumes are increasing, giving a buy signal. If current trend maintains, it is recommended to open buy positions after breakdown of the level of 1.3900 with the targets of 1.3945 and 1.4000.